Eye injuries can happen in a variety of circumstances. Most eye injuries occur in the workplace when solid particles such as metal slivers, wood chips, sand, or cement chips get into the eye. Smaller particles in smokes, and larger particles such as broken glass, also account for materials involved in causing eye injuries. Chemical burns, biological agents, and thermal agents, from sources such as welding torches and UV light also contribute to occupational eye injury. Blunt force trauma can also occur if an excess of force comes into contact with the eye. Therefore, eye protection can be extremely important in the workplace when there are certain jobs being done, such as welding, and handling any harmful/corrosive/acidic materials. 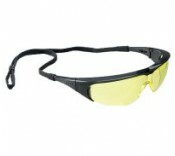 Safety glasses - Safety glasses provide protection from external debris, and are recommended to provide side protection via wrap-around designs featured in our products. They are a useful form of additional protection, can be worn over standard eyewear, and also provide protection from impacts, chemical splashes, and blood-borne hazards. Safety goggles - Safety goggles provide more protection than safety glasses due to being sealed around the surrounding area of the eyes, and are therefore more suitable when the risk potential of eye injuries is higher. They are therefore most suitable for preventing eye injury from chemical splashes, impacts, dusty environments and welding. 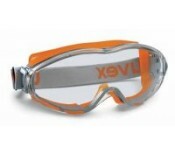 We provide safety goggles that allow a high air flow rate to pass through them, in order to prevent fogging. We also have lens cleaning stations available in both sub-categories.